In 1972 Truro 3rd XV had folded and a number of their players came to St Agnes.These players, along with Gerry Jones and other local players formed the first rugby club for St Agnes. Gerry Jones, the late Pete Stoddard and the late Craig Bradford were very influential in the early running of the club. Playing on a sloping pitch at Wheal Butson, obtained from a local farmer by Alan Thomas, with telegraph poles as goalposts(and these lasted for many years to come),the club was on it’s way. During this period the Peterville Inn was used as Club HQ, with a small hut for showers and the club's existence was very much hand to mouth. Training during this time was in many different places-Wheal Butson in the light nights, the football shingle 5 a side pitch at Enys Parc, which was to be turned into the current playing pitch in later years, an old field in Penwinnick where small generators had to be carried by hand to provide some very dim lighting and even indoors at Goonbell riding stables, a rather smelly time. Into the 1980’s and the club was still playing at Wheal Butson, although it had moved it’s clubhouse to the Driftwood Spars, where larger, but still small showers were built. Jill and Gordon Treleven, the landlords, made the club very welcome and many will remember ‘bar diving’ in the top bar being a regular post match activity. In 1985 the club moved it’s base to the newly formed St Agnes Sports Club at Enys Park and many players will remember the barefooted walk from a potrakabin used as changing room, over chippings, for a shower in what is now the clubhouse. The plan was to develop the old hard standing 5 a side practice pitch for a new rugby pitch. This was duly done with much local fund raising; hard work and planning and was first played on in 1992. In March 1986, the club reached its first Cornwall Junior Group Final and, lost to Helston 11-6 at the Redruth ground. This game resulted in the club winning its first silverware, the Goldsworthy Cup. The following season the club played in the then Senior clubs knockout tournament and lost to Camborne in the quarter finals 47-0. The club has always been involved in the village community and has been very well supported over the years by the local pubs (a feature that was naturally reciprocated),from the times of Roland and Sandra Honour (St Agnes Hotel) Jill and Gordon (Driftwood Spars), the late Jack Williams and Sylvia (Railway) and Mike Russell (Wine Bar) through to the current times of Bill and Di English (St Agnes Hotel), Tim Bawden (Taphouse) and Simon Smith (Victory), the club is very grateful for the time and money that our village pubs have provided. In 1993/94 season the club won the Alan Barbery award for the highest percentage of wins, for all clubs in Cornwall. In the 1993/94 season the club won the inaugural Cornwall Clubs league (equivalent of today’s Tribute Cornwall 2 league). The playing strength continued and in 1995 the club reached the final of the Junior Group for the second time, losing to Redruth Albany and a very young Simon Parrott. In 1998/99 the club lost to Bodmin in the Junior Cornwall Clubs KO Cup. The playing and social side of the club continued to grow. Whilst results did not always go our way, the social side of the club continued unabated with the arrival of Glen and Simon Parrott who through playing, coaching, fundraising and touring played an active part in the club for some 10 years. The late 90’s saw the first 10 a side vets tour to Jersey and this tour continues to this day with the club winning the tournament in 2002. The late 90’s also saw the club have good cup runs in the National Pilkington Shields for Junior clubs, making it through to the last 16-an excellent achievement. The turn of the century saw many old hands hang up their boots or move away and the club took a new direction encouraging younger players into the club to replace the old uns and the appointment of Kit Watkins, Sam Sargent and Jamie Watkins as Captains in their various seasons was proof of this change. This encouragement of younger player involvement is still very central today to the club’s ethos. The club has always been keen to support charities and during this period various charity games have taken place with considerable amounts of money being raised for Cancer Research, RNLI, Shelter Box, Cornwall Air Ambulance and the Max Levene fund. The Vice presidents society was formed in 2004 and it now exceeds 60 paying members. The annual VP lunch is one of the highlights of the non-players season The VP’s provide the main fundraising income for the club and their support is very much appreciated. The last 4/5 years has seen the club develop a strong link with the Peninsula Medical School and many student doctors and doctors have and still are playing for the club. Much has changed for the 2014/15 season. There is now a brand new changing room complex at the club and a new team leading the playing side. New coach Marc Dennis is relishing the opportunity to use his experience, playing for Old Dunstonians amongst other clubs, to work with the players. 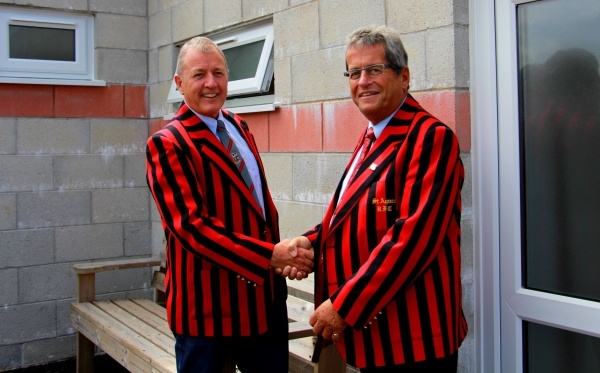 New captain Darryl Harding takes over from long serving captain Rob Jefferies and welcomes players old and new, who want to play for a forward thinking St Agnes RFC.The club has an excellent pitch with, arguably, the best views in the County, not to mention the brand new changing rooms. Whilst the club was relegated to Tribute Cornwall League 2 last season, there is a very positive air amongst all the players, who are looking to ‘bounce back’ to League one, with the emphasis on playing open rugby and enjoying themselves in the process-an Aggie tradition.